It’s almost a month after it happened, but I’ve finally prepared and am distributing MY release about the passage of the Emergency Vehicle Lemon Law. You can see the release here. The release talks about the importance of the new law, the unusual opportunity this challenge created to combine my love for public safety and my love for public affairs, and my true belief that this event showed that our form of government does work. The legislators in the 24th District issued their release a month ago and the Daily Record (Parsippany) did a nice series of articles, including an editorial on Jan. 27 praising me! That was a first. Anyway, thank you again for your help with this law. Feel free to pass this release on to anyone who might find it interesting. Flanders Ambulance 87, the Braun ambulance on a 2005 Ford E-450 chassis that triggered New Jersey’s Emergency Vehicle Lemon Law, caught fire while unattended in its firehouse bay Thursday morning. Two firefighters were hurt fighting the fire, which did substantial damage to the ambulance, and minor damage to the firehouse. Police told the local newspapers that the cause of the fire was in the ABS mechanism of the engine. Newspaper coverage can be seen here and here. It’s an ironic end to an ambulance that has given the fire company grief since the day it was purchased. After Ford and International tore the engine apart and put it back together, the ambulance served the fire company well for a couple of years. Today, the ABS light came on while the ambulance was returning from a call. It was taken out of service and parked. A short time later it caught fire. There are two items of good news: First, no patient was in the ambulance when it caught fire. Second, with our new emergency vehicle lemon law, any emergency vehicle delivered with as many demons as this one had would have been taken out of service and replaced long ago. 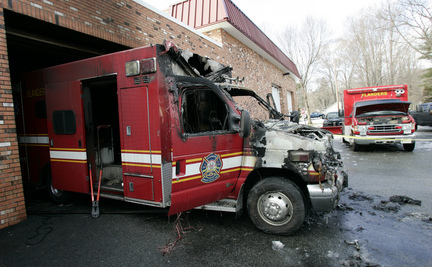 Ambulance 87, the inspiration for New Jersey's Emergency Vehicle Lemon Law, caught fire while sitting in its firehouse bay unattended. Just to let you know, the Daily Record of Morristown ran a story yesterday about the Lemon Law. Unfortunately, they only got about half of the story into their electronic edition, so you can read what they did publish here. WRNJ Radio, in Hackettstown, also interviewed me about the law, so the word’s getting out. And, yes, the release is still coming. The delegation from the 24th Legislative District has issued a news release announcing the passage of Emergency Vehicle Lemon Law. The release, on the NJ Assembly Republicans Wb site, can be seen here. Sen. Steven Oroho, Assemblywoman Alison Littell McHose and Assemblyman Gary Chiusano responded promptly two years ago when I contacted about the need to extend NJ’s Motor Vehicle Lemon Law to emergency vehicles. With the support of Flanders Fire Company and Rescue Squad, which had an ambulance that would have fallen under the rule signed into law earlier this month, I explained the problems emergency vehicle operators face when an emergency vehicle doesn’t perform. The three legislators, with help from Sen. Barbara Buono and Assemblyman Jack Connors, quickly introduced the legislation that, with some negotiated changes, is now law. Our thanks to all of the legislators involved. This week, I’ll also be issuing a news release. Please let us know here if you are considering using the new Lemon Law on a vehicle. New Jersey operators of fire trucks, ambulances, police cars and other emergency vehicles now can demand a replacement vehicle or refund of the purchase or lease price of the vehicle if it has chronic problems and can’t be repaired. Former Gov. Jon Corzine signed A3396, the bill that brought emergency vehicles in the state under the Lemon Law. The bill became effective immediately. You can read the final version of the law here. Thank you to everybody who has supported this and helped us push this through. I’m going to generate a news release in the next day or two. If you have a comment you’d like to include, please respond here. A set of bills that would bring emergency vehicles under the state’s lemon law today completed its legislative journey when the Assembly passed A3396 with the amendments inserted by the Senate. The set of bills now goes to Gov. Corzine. He must sign it by Jan. 19, his last day in office. Making the trip to the governor’s desk is not a guarantee that he will sign the law. I need to ask you to write one last note. This one’s easy. First highlight and save this: Please sign A3396/S2304 into law. These laws provide Lemon Law protection to those who energency vehicle operators, adding another assurance that police cars, fire apparatus and ambulances will be ready when they’re needed. Got it? OK, all you have to do is click on the link at the end of this sentence, select “Law and Public Safety” from the pull-down menu, the pick a topic from the next pull-down menu (I picked Consumer Affairs) then fill in the blank. At the bottom, you can paste in the sentence you highlighted and saved above , or you can write in your own remark. Got it? OK. Click here. Then click send and you’re done. Thanks. Let me know when you’ve said the note. And I’ll let you know what happens next. The New Jersey Senate approved the two bills that make New Jersey’s Lemon Law applicable to emergency vehicles. The Assembly version is headed back there on Monday, where the Assembly is expected to approve the changes to the bill made by the Senate. From there, it heads to the governor’s desk. While we don’t know for sure that Gov. Corzine will sign the bill, it has not been controversial and the state EMS Council has expressed its support for the law. I’ll let you know if we need to make the governor aware of our desire that he sign this bill. I’ll keep you apprised! NJ Emergeny Lemons is a discussion about defective emergency vehicles and bringing them under the protection of New Jersey’s Lemon Law. It’s written by a New Jersey paramedic who also is a volunteer with his local fire company and rescue squad.